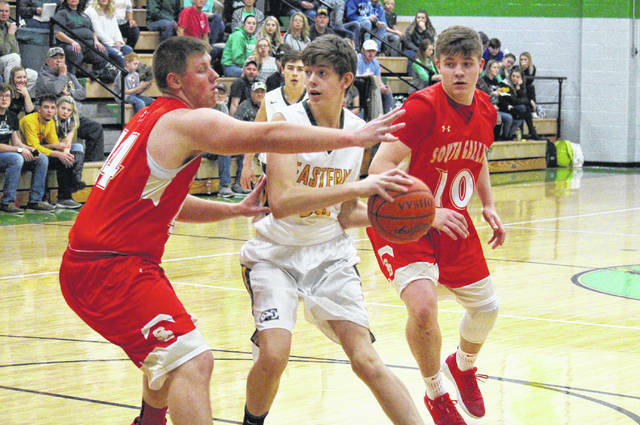 Eastern sophomore Garrett Barringer (center) fights through a double team set by Rebels Austin Day (left) and Eli Ellis (10) during the Eagles’ 64-43 victory on Tuesday in Tuppers Plains, Ohio. South Gallia senior Curtis Haner (5) drives past Eagles Kaleb Hill (center) and Sharp Facemyer (10), during Eastern’s 64-43 win on Tuesday in Tuppers Plains, Ohio. TUPPERS PLAINS, Ohio — Bouncing back in style. 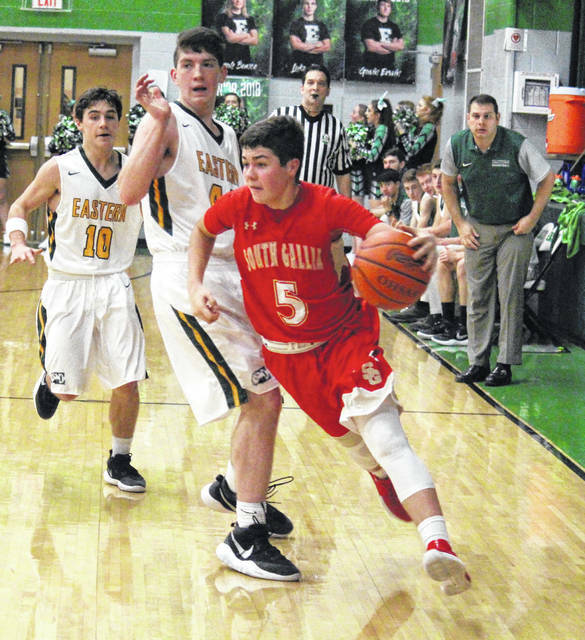 The Eastern boys basketball team snapped its two-game skid on Tuesday night at ‘The Nest’, making over half of their field goal attempts en route to a 64-43 victory over Tri-Valley Conference Hocking Division guest South Gallia. 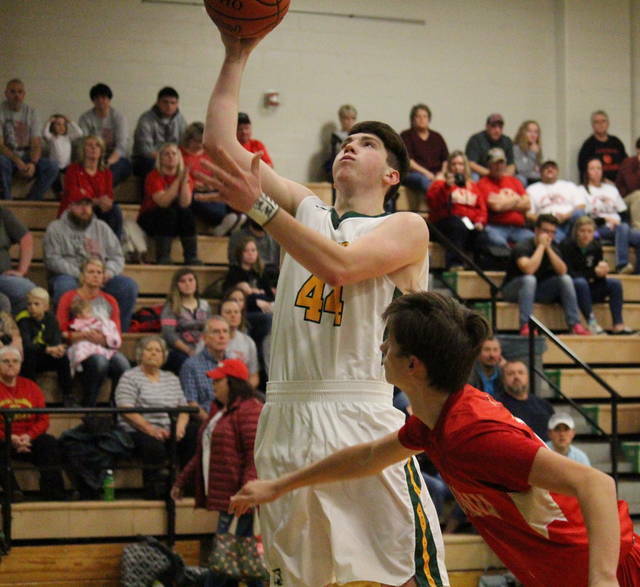 After the Eagles (2-2, 1-2 TVC Hocking) scored the opening bucket of the game, the Rebels (0-4, 0-2) claimed the next four points and their only lead of the contest with 5:39 left in the first quarter. Eastern scored the next nine points, however and wound up with a 15-7 advantage by the end of the stanza. South Gallia began the second quarter with a 5-4 run, but was outscored by a 14-3 tally over the remainder of the period, as Eastern headed into the half with a 35-14 lead. The Rebels had their best offensive period of the night in the third, outscoring EHS by a 17-15 clip over the eight minute span. Eastern capped off its 64-43 victory with a 15-to-12 run in the fourth quarter. The hosts claimed a 30-to-23 advantage on the glass, despite SGHS earning a 10-8 edge in offensive rebounds. Both teams finished with 16 turnovers in the game, with the Eagles earning a 10-to-7 advantage in steals. Eastern also claimed a 16-to-9 assists advantage, while the Rebels held a 4-to-3 edge in blocked shots. Collectively, the Eagles shot 26-of-46 (56.5 percent) from the field, including 2-of-6 (33.3 percent) from beyond the arc. Meanwhile, the Rebels were 17-of-50 (34 percent) from the field, including 4-of-15 (26.7 percent) from deep. From the free throw line, Eastern shot 10-of-14 (71.4 percent) and South Gallia was 5-of-9 (55.6 percent). EHS sophomore Garrett Barringer led the hosts with a double-double effort of 16 points and 10 rebounds, to go with a team-best four assists. Isaiah Fish scored 15 points and Sharp Facemyer added 12, with both players draining one three-pointer in the win. 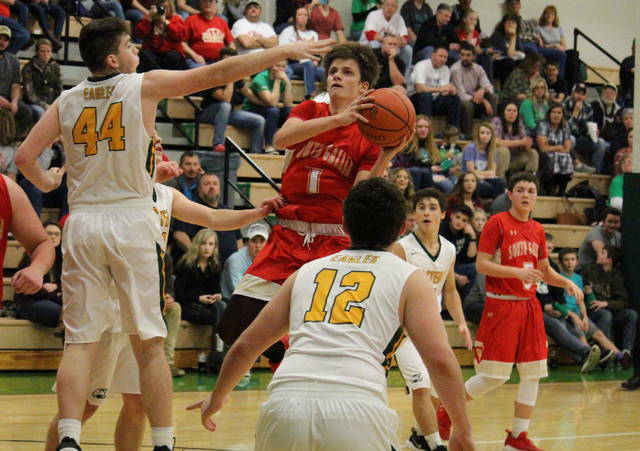 Eagles senior Kaleb Hill contributed eight points and seven rebounds to the winning cause, Colton Reynolds added six points, while Blaise Facemyer had five points and four assists. Ryan Dill rounded out the EHS offense with two markers. On defense, Barringer came up with a game-best three steals, while Hill had two steals and two rejections. The Rebels were led by Braxton Hardy with 18 points, including six from long range. Curtis Haner hit one trifecta on his way to 10 points,while Jared Burdette made one triple and finished with five points. Eli Ellis and Austin Stapleton posted four points apiece in the setback, while Austin Day scored two. Day and Burdette tied for the team lead with five rebounds apiece. Ellis and Haner both assisted on two buckets, while also leading the Rebel defense with two steals and a rejection apiece. These teams will do battle again on Jan. 30 in Mercerville. Both teams continue league play on Friday when SGHS hosts Wahama, and EHS visits Miller.